Augsburg College was one of six institutions in the nation to receive the Higher Education Civic Engagement Award for its commitment to public service and community involvement. The award, from The Washington Center for Internships and Academic Seminars, was presented Oct. 3 at the National Press Club in Washington, D.C.
"We don't think of what we do purely as community service," said Augsburg College President Paul C. Pribbenow. "We know that learning retention soars when learning is practiced by doing. We are richer for the experience of serving in the diverse Cedar-Riverside neighborhood—a neighborhood that allows us to educate students for lives of meaning and in a world marked by an urgent need for culturally competent residents." One example of the work that garnered the award for the College is Project STAR [pictured here], a special education licensure program in which Master of Education students coached teams of sixth to eighth graders at a local middle school special education classroom. Using the Public Achievement model of public problem solving, the young students teamed with the college students to find solutions to issues such as animal abuse, gang violence, bullying, and solar energy. Together they learned how to navigate the process behind issues like finding shelter for the homeless and installing solar panels to reduce energy costs. "The Higher Education Civic Engagement Awards were created in 2009 to find colleges and universities that are true role models for civic engagement in the academic community," said Mike Smith, president of The Washington Center. "Augsburg College has created an environment that brings students and community organizations together, showing that the best and most well-rounded academic experience is defined by hands-on and classroom learning." 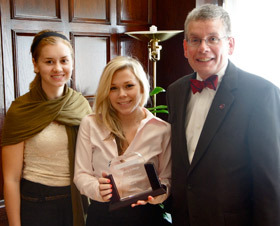 The award was accepted by a delegation representing the College including President Pribbenow [right]; Barbara Farley, Vice President of Academic Affairs and Dean of the College; Elaine Eschenbacher, Associate Director of the Center for Democracy and Citizenship; Kristin Farrell, Bonner Leader Program Director; students Katia Iverson [left] and Erika Coe [center]; Augsburg Regent Cynthia G. Jones '81 and Rick Jones; alumna LeeAnn Rock '81; and Jeanne Narum, Director of Independent Colleges. Augsburg was one of 140 institutions considered for the award. Other academic institutions receiving the 2011 Higher Education Civic Engagement Award include Benedict College, DePaul University, Duke University, Florida Gulf Coast University, and San Francisco State University. In addition to winning The Washington Center Award, Augsburg also won the 2010 Presidential Award for Community Service from the Corporation for National and Community Service. This is the highest award given by the organization to recognize institutions for their commitment to and achievement in community service. Augsburg is the only Minnesota institution—and only one of six in the nation—to receive this honor. The Washington Center for Internships and Academic seminars is an independent nonprofit organization that serves hundreds of colleges and universities in the United States and other countries by providing selected students challenging opportunities to work and learn in Washington, D.C. for academic credit.